If you’re looking for analysis of Usain Bolt’s magnificent 9.58s WR last night, you’re in the right place. Click here for our detailed analysis, including Bolt’s splits, speeds and a comparison with his previous world record in Beijing. Usain Bolt after setting a new 100m WR. Photo by Flickr user Lukas Ziegler (lukasziegler). Extra-ordinary. 9.58 seconds for 100m, and Usain Bolt just got better. Quite astonishing, as the Jamaican won the race by 0.13 seconds from Tyson Gay (who himself smoked a PB by six hundreths of a second)! I have no doubt that in the coming days, we’ll start to see some analysis of this race – there is a group of German scientists who are doing a comprehensive analysis and so we will, in due course, get some reliable information and it will provide some great food for discussion and scientific insights. I can promise you that we’ll definitely cover it when it arrives, so join us in the future. For now, however, I guess we just get to enjoy what we’ve just seen. Bolt’s race was near perfect. He got away so fast, just remarkable, with Tyson Gay alongside him and Asafa Powell one further over to his right. Those two might have expected that by 30m, they’d be ahead of Bolt – at least, that would be their plan, and maybe force Bolt to come past them. However, it never happened. Bolt led almost from the gun, his start being the big difference compared to last year in Beijing. He was out so quickly, something that had happened in the semi-final as well, and gave us a sign of what was to come, when he basically jogged to a 9.89s. Bolt has, somehow, managed to take sprinting forward AGAIN. One year after he moved the event (and the sport) into a new era with his exploits in Beijing, one might have forgiven him for a “routine” victory in the World Championships. But to see the event propelled forward even more is just remarkable, and the sport is better for it. To have such a great race (the three athletes in the middle lanes were the three fastest in history – Bolt, Gay, Powell) is indeed a rare privilege and it’s a golden era for men’s sprinting. Long may it continue, and maybe even improve again? Is that too much to ask? Doesn’t seem like it with Bolt. One thing I will say is that the commentators and fans have already begun making the mistake of using this performance to suggest that that we now know how fast Bolt might have gone had he not started celebrating 20m from the finish line back in Beijing in 2008. 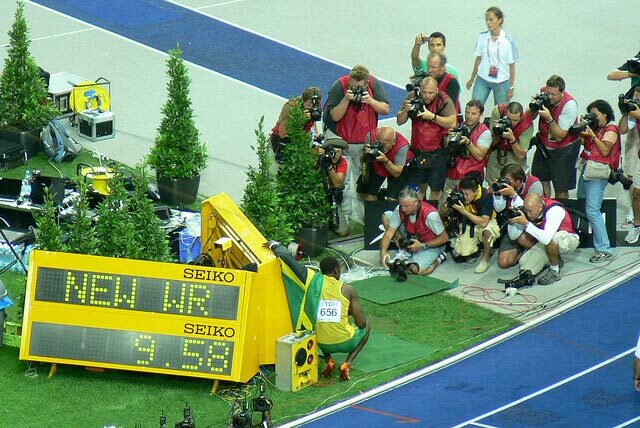 A number of posters are already chiming in saying “See, he could have run 9.55s in Beijing”. Seriously, that’s irrelevant now. It’s a year on, a different race. There is no way Bolt cost himself 0.11 seconds in Beijing. That said, a comparison between Berlin and Beijing will be very interesting – I can’t wait for te German research to be published. I have a feeling that we’ll see that of the 0.11 second improvement on his Beijing time, probably 0.08s of it came in the first 40m, and the other 0.03s comes at the end, where Bolt does not celebrate before finishing (at least, that’s my ‘hypothesis’ – bring on the data!). The big difference was that start, which was absolutely amazing. Usain Bolt, 2009 version is an even better athlete than we saw in Beijing – he has worked on his start, he has consolidated that middle part of the race, and he is just incredible.